These days, making cutting boards from bamboo is very popular. Did you know that bamboo is actually a type of grass, rather than a wood? The main reason people like bamboo cutting boards is their hardness, plus the fact that they are very resistant to bacteria. Regular wood cutting boards, over time, get grooves in them where bacteria can get caught and transfer to food. This is especially true if the cutting board is not cleaned properly. Bamboo is a sustainable product. Unlike trees, bamboo actually restores itself within 3 to 5 years. Plus it’s biodegradable (unlike plastic). While a wood board is also biodegradable, the trees that wood cutting boards are made from don’t restore themselves as quickly as bamboo. Bamboo is much lighter than hardwood. The different varieties of bamboo that are used to make bamboo cutting boards are not usually taken from habitats that are occupied by the giant panda. If you’re a big fan of conservation, this is another plus to using a bamboo cutting board. Bamboo is not as porous as other woods. So it will not soak up as much water or bacteria as other woods might. Therefore, it won’t shrink or swell. Bamboo cutting boards are easy on your knives. It’s hard to scar a bamboo cutting board with a knife. At the same time, it’s soft enough not to damage or blunt your knives. Those are the main advantages of using bamboo cutting boards. As you can see, there are plenty of good reasons to consider replacing your current cutting boards with bamboo ones. As with anything, there are also a few disadvantages when it comes to using a bamboo cutting board. You need to “season” bamboo cutting boards regularly — which can be time consuming. Seasoning will prolong the life of your bamboo cutting board. To season your board, first wash it with hot soapy water. Then, wait for the board to dry. Once it’s dry, saturate the board with food-safe mineral oil. Wipe the mineral oil off. Repeat this process at least 2 more times before using it for the first time. After that, you’ll want to re-season the board every month. You have to wash a bamboo cutting board by hand. It cannot be put in the dishwasher because there are more glued pieces that could come apart than with regular wood cutting boards. Bamboo cutting boards are more expensive than regular wood cutting boards. 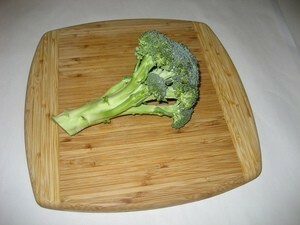 In fact, they’re among the most expensive cutting boards on the market today. Some bamboo cutting boards are glued together with adhesives that have formaldehyde in them — which could eventually leak into and contaminate food. When buying a bamboo cutting board, make sure that it has a non-toxic label on it in order to avoid this. Overall, bamboo cutting boards definitely get my vote! As long as you’re comfortable with hand-washing, and you remember to get one that was made with non-toxic glue, then you are pretty much good to go. While clean up and routine care may be time-consuming, I think the advantages outweigh the disadvantages — particularly the environmental ones.